Thesis (M.S.) --University of Florida, 1996. Includes bibliographical references (leaves 85-90). I would like to extend special thanks to Dr. A. J. Mehta for his intricate attention to detail, and constantly keeping me focused on the path of least resistance by challenging me to resist my impulses. I thank Dr. D. M. Sheppard for opening my eyes to lands west of the Atlantic. I thank Dr. R. G. Dean for always having an open ear, and for being so diplomatically delicate in his responses. I appreciate the understanding of all nine of my office mates who were a part of my regimented lunch routine. I would like to express my sincere gratitude to everyone who gave me their time and energy; without their assistance the road would have been additionally windy and infinitely bumpier. This study was partially funded through contract DACW39-94-K-0043 from the Coastal Engineering Research Center (CERC) of the U.S. Army Corps of Engineers Waterways Experiment Station, Vicksburg, MS. Thanks are due to Mr. Gary Howell of CERC for project support and management. and without [(c) and (d)] the accretionary portions of the profile included. 4.19: Bathymetric chart of South Lake Worth Inlet (from Olsen and Associates, Inc.
Sandy ebb deltas in the microtidal sea environment subject to storm waves and surges are represented in terms of an idealized geometry guided by measured offshore profiles in the vicinity of inlets, and the method of Dean and Walton for calculating delta volumes. Characteristic delta features include an arcuate planform shape, ebb channel, marginal flood channel boundaries, a swash platform and offshore slopes that are defined by a generalized power-law akin to that commonly used for delineating beach profiles. Delta volumes calculated by using realistic values of the geometric constants are shown to result in values that are comparable to those measured at inlets. equilibrium is an order of magnitude greater than that corresponding erosion time-constant for beach erosion. This finding, which is a reflection of the relatively slower response of the delta than beaches to eroding forces, is seemingly in agreement with natural events, and requires further exploration through detailed pre- and post- storm monitoring of inlet deltas. The model is used to show that reductions in delta volume due to wave forcing are commensurate with volumetric changes recorded at several inlets. When planning a beach nourishment project it is often found that an economical, beach compatible offshore sediment source is not available (Walther, 1995). In recent years, therefore, the trend has been to look to the ebb deltas at sandy inlets for a comparatively inexpensive source of beach quality sand. At present, the potential effects of mining the delta for sand on the littoral system cannot be accurately predicted. Some possible effects of mining are alterations in the inlet hydraulics and sediment transport pathways, focusing of wave energy on the nearby shoreline causing erosional "hot spots," and deprivation of the downdrift shoreline of its sediment supply due to a reduction in the natural by-passing ability of the inlet system. delta, including ebb and flood channels and a swash bar platform. Figure 1.2 is the bathymetry of a typical sandy microtidal inlet ebb delta system. This study is concerned with the response of such deltas to forcing by episodic waves and the associated storm surges. As a basis for this work, we will first consider criteria for delta mining and illustrate examples of mining from available sources. Using knowledge of the beach fill template and length of beach nourishment project, a volume requirement of sand can be determined. In order to make an educated decision whether to mine this volume of sediment from the delta, three criteria must be satisfied. The first criterion is the availability of this volume of sediment, and the corresponding cost for transportation and placement on the beach. Too small a volume, or too large a pumping distance for the dredge could exclude the sediment source. The second criterion is the composition and size of sediment available for mining. A sediment size smaller than native will provide a smaller dry beach width than the same fill volume of native sediment (Dean and Dalrymple, 1996). The third criterion is based on assessments of physical and ecological impacts of the proposed operation. Acceptable changes to the hydrodynamic and sediment transport processes surrounding the mining area must be predicted. Some probable environmental impacts to the benthic habitats due to inlet modifications are briefly mentioned by Mehta and Montague (1991). Figure 1.3 is a flow chart showing the three sets of criteria that must be satisfied when considering delta mining. these 1.teFawrehnot stiiedteuring sbeelecton fof asnewtasie (fro Meaelty ao. 1996). Frequency (Hz) Figure 1.4 Wave spectra from stations near Norderney, Germany (adapted from Niemeyer, 1985). changes to the nearby shorelines. One cause of shoreline change would be the reduction in sediment supply to the downdrift shoreline caused by impoundment of littoral sediment in the dredge pit. Bruun and Gerritsen (1959) describes the transfer of sand from the updrift to downdrift sides of the inlet as occurring over the, "shoal or offshore bar." A dredge pit could possibly interrupt the main sediment pathway across the delta in a bar by-passing type of inlet system, and thereby change the shorelines in the vicinity. Another cause of shoreline change would be modification of the wave climate due to the reduction of the wave sheltering capability of the ebb delta due to mining. Figure 1.4 shows measured wave spectra at three stations near Nordemney in Germany (Niemeyer, 1985). Note that there is a substantial reduction in wave energy from the offshore station I to the ebb delta sheltered station II. ____________delta _____ beach Cutterhead Nassau Sound, FL Outer, updrift and 1994 2,140,000 Updrift beach 76 cm. delta _____ ______Port Royal Sound, SC Seaward edge of 1990 596,00C Downdrift 76 cm. Table 1.2: Benefits, adverse impacts and monitoring at inlets given in Table 1. 1. Captain Sam's, SC Relict delta "pushed" None were predicted to Entrance began migrating ashore by wave action occur; no impacts were to the south at it's previous nourished the beach at monitored rate the rate of 130,000 Mi3! Sam's Inlet to a maximum of 4.9 x 106 m3 at Great Egg Inlet, and in the majority of cases the material was placed on a segment of the beach downdrift of the inlet. The method of dredging included the use of cutterhead dredges, dustpan dredges and a hydraulic hoe at Hog Inlet. Artificial closure of Captain Sam's Inlet was a novel method making use of natural forces to transport relict delta sediment to the downdrift beach. Closure of the old entrance was carried out by earthmovers and bulldozers. It should be emphasized that the information in Tables 1. 1 and 1.2 is based on the given citations only, and therefore does not include any subsequent studies, e.g., monitoring, that may have been carried out at the inlets considered. Although as noted, each of the beaches in Tables 1.2 received the benefit of additional sediment within their system, in some cases there was no pre-project study to predict possible adverse effects on the nearby shoreline due to mining of the delta. Also, post-project monitoring was not always performed. Where it was performed, adverse effects were recorded in all cases. If a standardized procedure were developed for delta mining site selection, prediction of impacts and post-project monitoring, the processes involved could be better understood in the future, and mining planned better. between the intensity of the wave forcing and the magnitude of the by-passing since, according to Bruun and Gerritsen (1959, p.98) "experience demonstrates that such bypassing cannot exist without considerable wave action." In response to the need for prediction of the navigability and stability of an inlet, Bruun and Gerritsen (1960) defined an inlet stability ratio. The ratio of the spring tidal prism passing through the inlet over one-half tidal cycle to the annual average rate of littoral drift reaching the inlet was considered as the relevant stability ratio. Large values of this ratio (>150) correspond to inlets which have good flushing characteristics, and large clearances over the delta. As the value of this ratio decreases the ebb delta becomes more pronounced, and the controlling depth of water above the delta decreases. When values of the stability ratio are small enough (<50) the natural channels are very shallow and unreliable becoming dangerous for even shallow draft vessels. where g is the acceleration due to gravity. Mehta and Hou (1974) plotted the values of a versus tidal prism for many inlets of known stability. A line was drawn that separated the unstable high values of the coefficient from the stable low values, thus confirming the stability relationship (Eq. 1. 1). A method was needed to predict the quantity of sediment to be removed from the inlet channel during maintenance dredging. For that purpose, Gole et al. (197 1) proposed an empirical formula for sedimentation in dredged channels within inlets by determining the percentage of the total littoral drift that will be entrapped by the increased depths and the corresponding decreased current velocities across the channel. that wave action will limit the volume of the delta to some equilibrium volume by transporting sediment deposited by the ebb currents back toward the inlet. Dean and Walton (1973) also developed a method for determining the sediment volume in the ebb delta. In this method, a grid, as well as the elevation contours that would exist in the absence of the inlet, or the "no-inlet" contour lines, is superimposed on the plot. The difference between the no-inlet and delta elevation at each node of the grid box is calculated, averaged over the four corner values for the grid, and multiplied by the surface area of grid to find the delta volume within the grid box. The total delta volume is then the sum of all of the grid box volumes. This method was applied to twenty-three Florida inlets. Figure 1.5 is a representation of the grid system and the no-inlet contours for a typical inlet. Continuing the work of Dean and Walton (1973), Walton and Adams (1976) analyzed the delta volumes of forty-four tidal inlets around the United States. The inlets were divided into three different incident wave energy groups, and the delta volumes were plotted versus tidal prism for each group. A power-law relation was fit to all three data sets. The differences in the power-law coefficients implied the dependence of delta volume on wave energy. passing occurs, and shallow dredged channels tend to approach the natural depth at a slower rate than a deep dredged channels. Marino (1986) applied Dean and Walton's (1973) method to Florida inlets. A dimensional analysis was preformed to determine relationships between relevant inlet parameters. From this analysis and its application to Florida inlet data, Marino (1986) concluded that the delta volume not only depends on the tidal prism, but also on the ratio of throat width to channel depth. In order to understand sediment transport processes in the vicinity of the tidal inlet, Ozsoy (1986) analytically modeled the sediment transport resulting from the turbulent jet. Ozsoy's (1986) results were: 1) Increasing bottom friction caused jet flow sediment concentrations to decrease and, in general, the resulting sediment deposition to become fanshaped and relatively close to the inlet mouth. 2) Decreasing the bottom slope caused sediment to be transported further offshore in elongated shoals flanking the channel. 3) Material with small settling velocities was jetted far offshore, while gains with large settling velocities were deposited closer to the inlet mouth. 4) Currents less than the critical value for the initiation of sediment movement caused sediment to deposit close to the mouth, while currents with a value much greater than critical caused sediment to be jetted farther from the mouth. delta system from the addition of littoral drift material could remain in the delta system or be by-passed to the downdrift shoreline. Hayter et al. (1988) performed a laboratory study using a moveable bed model in order to examine the effects of both waves and tidal flows on inlet delta formation. One result of the study was that the delta volumes were larger in the experiments run with waves and tidal currents than in experiments using only tidal currents. An explanation for this phenomenon is that the presence of waves increases the bottom shear stress over the currentonly condition, suspending additional littoral material which is ultimately deposited in the enlarged ebb delta. Ultimately, Hayter et al. (1988) concluded that the delta volume was proportional to tidal prism, and inversely proportional to wave energy, agreeing with O'Brien. impacts to the natural state of inlet by-passing. Several possible impacts to the benthic habitats in the vicinity of the tidal inlets due to inlet modifications were discussed. To quantify reduced by-passing across the dredge pit at an ebb delta, Walter and Douglas (1993) developed a method to predict the shoaling rate within the borrow area. The method was similar to the work on sedimentation in entrance channels by Gole et al. (197 1). Walther and Douglas (1993) considered two borrow pits of the same volume but differing dredged depths. For the particular input conditions of littoral drift, pre-dredged depth, and volume removed, the shallow pit was found to have twice the initial by-passing rate as the deep pit. The rate of increase in by-passing was larger for the deep pit, which returned to the pre-dredged condition in about five years, while the shallow pit required about fourteen years to equilibrate, with both pits eventually by-passing equal after equilibrium was achieved. relationship between the delta volume and a was shown to be in agreement with the observed variation in delta volume at four microtidal inlets. In order to evaluate the depositional characteristics of inlet tidal flows, Merz (1995) developed a computer code that combined previous analytical expressions for flood and ebb flows over sloping bottoms with bedload and suspended sediment transport formulas to predict sediment deposition over a tidal cycle. The model was applied to Jupiter Inlet and was shown to match the actual depositional characteristics of the delta. Table 1.3: A smmary of previous delta studies. Bruun and Defined inlet stability ratio as the ratio of spring tidal prism passing through inlet during one-half Gerritsen tidal cycle to the average annual littoral drift reaching the inlet. Large values of the stability ratio (1960) correspond to stable and deep deltas, while small values correspond to unstable and shallow deltas. Gole et al. Developed a formula to calculate the percentage of total littoral drift which will accumulate in a (1971) dredged channel due to increased depths, and the resulting, decreased current velocities across channel. 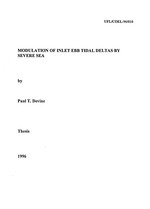 Dean and Described the nozzle and sink characteristics of tidal flows through inlets, both of which result in Walton net flow toward the inlet along the shoreline close to the inlet. Developed a method for measuring (1973) delta volume. Galvin Developed a method to determine the time for channel shoaling to reduce project depth from the (1982) initial over-dredged depth to the design depth by calculating the channel shoaling rate. Marino Described problems inherent in applying Dean and Walton's (1973) method to calculate delta (1986) volume at inlets. Found that the delta volume not only depends on the tidal prism, but on the ratio of throat width to channel depth. Hayter et a]. Moveable bed laboratory model study to determine the effects of wave action and tidal flow on the (1988) delta formation. Concluded that an increase in tidal prism, or a decrease in wave energy will increase the volume of the ebb delta. Walther and Applied Gole's (197 1) theory on by-passing/sedimentation rates around a dredged channel to two Douglas hypothetical borrow sites at an ebb tidal delta. Initially the deeper site had half the by-passing rate (1993) of the shallow site, but returned to the pre-dredged condition in 9 years, where the shallow site took 14 years to recover. simulation agreed with the actual depositional patterns surrounding the inlet. where to borrow sediment from the delta must be made considering the possible effects to the surrounding shorelines due to mining, and requirements for refilling of the pit for renourishment. As noted, in response to this issue Mehta and Montague (1991) defined "active" and "passive" zones, which correspond to the frequency and severity of sediment transport due to episodic wave conditions. The active zone represents the area of the most frequent wave action, and where sediment by-passing customarily occurs. It is in the active zone that delta mining should be avoided, so that any potentially adverse effects to the surrounding shorelines can be prevented. Mehta et al. (1996) suggested that the limit to the active zone of sediment transport can be found by applying, with minor modifications, concepts derived from beach profile dynamics. As shown in Figure 1.6, the seaward limit to the active zone of sediment transport due to severe wave conditions is defined by, hid, the depth of closure. The depth at which there is no net sediment transport is defined by the crossover depth, h..0. The profile from the shoreline to the so-called crossover depth will experience erosion due to severe storms, while the profile from the crossover depth to the depth of closure will experience accretion in the form of a bar. It should be noted that the depth of closure, the length of active profile and the crossover depth are directly related to the return period of the wave episode, or increasing bottom response time (Dean et al., 1993). Thus, for example, the depth of closure for the Atlantic coast of Florida has been estimated to be from 4 mn to 7 m (Dean and Grant, 1989), while on the Genkai Sea in Japan the depth of closure has been estimated to be around 35 m (Kojima etaL, 1986). Figure 1.6: The length of active profile extends from the shoreline to the depth of closure, hid. The crossover depth, hcc, separates nearshore and offshore zones within the active length. Dashed curve corresponds to a storm profile, whereas the monotonic curve represents profile formed under comparatively mild wave conditions (from Mehta et al., 1996). Figure 1.7: Schematic drawing of an idealized cross-shore profile near an inlet and episodic change in profile geometry due to wave action, where "y" is the distance offshore, "h" is the depth of the inlet profile, "yo" is the distance from the beginning of the channel to the origin of the profile defining the seaward slope of the delta, "U,," is the current emanating from the inlet, "U c" is the current over the delta crest, "k0" is the depth of the inlet channel, "h is the depth of closure and "h,0" is the crossover depth (from Mehta et al., 1996). In Figure 1.7, a shore-normal bottom profile, which extends from the inlet channel to the depth of closure, is shown. Since the ebb current (U0) decreases to almost a negligible value (U~) at point A, the profile, h(y), between point A an~d B can be considered to be acted on by waves only. One can then assume that the pre-storm seaward slope of the ebb delta can be described by a function h = fl(y), and the storm seaward slope of the ebb delta as h = f2(y). The post-storm delta profile exhibits erosion in the active zone of transport, and accretion in the passive zone. If the recession of the seaward profile were to exceed the landward extent of the delta crest at point A, then wave action would penetrate the delta, thus possibly affecting the nearby shorelines significantly. The sediment which rebuilds the eroded delta profile after the storm may be transported into the eroded area either by the inlet currents, by littoral current, or by waves from the bar area. Additional modifications to the delta profile will depend on how much accretion occurred in-between wave events, and the severity of the next event. The active zone landward of the crossover depth can only be determined by the instantaneous configuration. Thus, the interpretation of the active zone of delta for mining purposes is dependent on the episodic return period of storm forcing. erosion of deltas due to storm waves and associated surges. environment of the bottom left third of that figure. Figure 1.8: Diagram depicting the three different delta classifications (from Hoekstra, 1988). Chapter 2 deals with the construction of a generalized delta based on relevant delta characterizing parameters. A method is developed to generate the required "no-inlet" bathymetry for defining delta volume. The delta surface is constructed from equations representing the channel section, the seaward slope of the delta. The method by which the delta parameters are calibrated is described. Chapter 3 describes the delta erosion process and the methods on which the process is based. Chapter 4 investigates the sensitivity of the delta volume to the choice of the no-inlet profile. The results of the delta erosion model applied to a generalized ebb delta are discussed, and qualitatively related to case studies of delta evolution at four different inlets. Finally, in Chapter 5 the study is summarized and general conclusions are presented. This chapter concludes with some recommendations for future studies related to the subject. For the purpose of this study, it is necessary to develop a geometric method for construction of the ebb delta volume. The volume is represented by a series of generalized mathematical expressions characterized by seven delta related parameters. A specific delta can be simulated by varying these parameters until the surface generated by the mathematical expressions mimics the actual shape of the delta in question. The standard procedure to determine delta volume involves constructing parallel contour lines which would exist if no inlet were present. The depth differences between the no-inlet bathymetry and the actual bathymetry of the delta determine the volume of the ebb delta in question. This method is described in detail in Dean and Walton (1973), and was briefly mentioned in Chapter 1. Figure 2. 1: Delta planform schematic. where n is the integer for delta radial profile number, r is the radius along the profile and 0 is the angle of the profile with respect to the updrift shoreline. In constructing the delta surface, n = 37 profiles are developed for an adequate representation of the delta surface. Thus, each profile represents a 60 = 50 differential slice of delta. A general elevation profile is shown in Figure 2.2. The assumed pre-storm erosion delta profile is shown as a solid line, and the differential delta volume is identified by the hatched area. The first step in developing the delta volume is to define the "no-inlet" profile. This profile is assumed to take the power-law form of Eq. 2.2, (Dean, 1977), where H is depth, X is normal distance offshore, A is a "scale factor," and M is a "shape factor." Figure 2.2: Schematic of delta elevation profile. The determination of the variable scale and shape parameters AN and MM, is described in Section 2.3. The volume of sediment above the no-inlet elevation is considered part of the pre-storm delta. Delta depth, HS, is defined thus to avoid any discontinuities when considering delta profiles that are parallel to the shoreline, i.e., corresponding to 0 = 0. Determinations of VL(n), A(n), and M(n) are given in Section 2.4. The virtual origin defines a reference point for the beginning of the seaward profile, and sets the depth of the theoretical seaward slope to zero at the origin. The seaward slope is the portion of the delta slope above the intersection with the channel profile. When the depths over the seaward slope exceed the corresponding depth of the no inlet profile, the value of the seaward slope is replaced by the no-inlet depth. parameters. Appendix A gives the code used for calculating these two parameters. The result of the averaging and fitting of Eq. 2.2 is given in Figure 2.3. Bathymetric plots were used for determining the parameters HC, CW, A(n), M(n) and VlI(n) for constructing the delta. A location that was "central" on the delta was designated as the origin. Placement of this origin was somewhat arbitrary, and it is difficult to draw a distinct criterion for this placement. However, in general, it should be noted that the origin should be in the ebb channel, so that a line drawn through it is just seaward and parallel to both the updrift and downdrift flood channels. In case there is no discernable flood channel, the line should be drawn over, and parallel to, the delta crest, or at the inflection in the shorenormal profile. In case there is a considerable delta offset, i.e., asymmetry with respect to the updrift and downdrift shorelines, the line should cross just seaward of the recessed shorelines flood channel, and traverse the seaward shoreline. If there is a significant angular difference between the shorelines, the line should be directed over the crest of the most discernable ebb/flood channel, and traverse the other shoreline. The average depth of the channel region should be selected as HC, and the average distance from the shore-parallel line to the shoreline as CW. Figure 2.4 is an example of placement of the profile origin, with shore-parallel and shore-normnal lines. Figure 2.3: Least squares fit of PBC R-3 1978 and 1990 data to Eq. 2.2. Figure 2.5: Profiles #1-4 from Jupiter Inlet delta, February, 1980. Figure 2.6: Profiles #5-8 from Jupiter Inlet delta, February, 1980. Figure 2.8: A-Parameter data from Jupiter Inlet delta, February 1980, and corresponding parabolic fit. Figure 2.9: Profiles #1-4, fit with parabolic relation for A(n) and VI(n) from Appendix A. Figure 2.10: Profiles #5-8, fit with parabolic relation for A(n) and VI(n) from Appendix A. Figure 2.11: Profiles # 9-11, fit with parabolic relation for A(n) and VI(n) from Appendix A. The Value of Mm~x was set equal to the largest M(n) value in the data set, and M ~was varied until the least squares error was the smallest. Appendix E gives the code, which fits the parabolic relation (Eq. 2.9) to the data of M(n). Figure 2.12 shows the fit of the parabolic relation to the M(n) data for the February, 1980 Jupiter Inlet survey. A method was developed to take the eleven virtual origin values and interpolate them so that thirty-seven data points were generated, as required for the delta modulation method described in Chapter 3. A listing of the following method is given in Appendix F.
Figure 2.12: M-Parameter fit with A derived from hyperbolic relationship. Figure 2.13: Polar plot of virtual origin, VI data, and the corresponding average VI values for February, 1980 Jupiter Inlet survey. Numbers on the exterior of the plot are the profile angles with respect to the updrift shoreline. Concentric circles are lines of equal radii in meters. Figure 2.14: Average VI data normalized by the maximum alongshore and offshore distances of the virtual origin distribution, and the corresponding Gaussian fit with K = 1.52, February, 1980 Jupiter Inlet survey. Figure 2.15: Plot of the 37 data points of VI for input into delta modulation model. Numbers on the exterior 'of the plot are the profile angles with respect to the updrift shoreline. Concentric circles are lines of equal radii in meters. Figure 2.14 shows a plot of the Gaussian fit in the normalized coordinate system, which was necessary for this representation. The values were scaled up by their maximum values, and the relationship was used to solve for VI(n) in selected 5' increments for input into the delta modulation code (Chapter 3). Figure 2.15 shows the thirty-seven data points input into that code. After developing a means for geometrically describing the delta volume, a method for modulating the volume is derived. For that purpose, and approach based on Kriebel and Dean's (1993) convolution method for time-dependent beach profile response to forcing by waves and associated storm surge was used to generate post-storm deltas. The basis for the convolution method is the Bruun Rule of erosion (Bruun, 1982). Bruun Rule is simply a response of beach profile to sea-level rise. This response is determined by shifting the profile (assumed to be in equilibrium with the prevalent sea conditions) upward by sea-level rise, and then landward until there exists a conservation of sediment mass eroded from the nearshore zone and deposited in the offshore zone, out to the limiting depth for sediment movement. A graphical representation of the Bruun Rule is shown in Figure 3. 1. The limit to the zone of sediment movement in the profile was defined by Bruun (1982) as a depth equal to twice the breaking wave height. The profile discontinuity at the limiting depth (vertically equal to "a", and horizontally equal to "s" in Figure 3.1), which is created by shifting the active profile up and back, is replaced with a deposit slope (Bruun, 1982). A diagram depicting the sea-level rise, landward shift of equilibrium profile and resulting deposit slope is given in Figure 3.2. Figure 3. 1: Bruun Rule of erosion, where "s" is the recession, "1" is the active profile length, "a" is the sea level rise, "d" is the depth of active sediment movement, "e" is the berm height, and "z" is the point of no net sediment transport (from Bruun, 1988). Figure 3.2: Bruun Rule of erosion, with deposit slope. (from Bruun, 1988). where Hb is the breaking wave height, A, is the scale factor for the profile, g, is the acceleration due to gravity, hb is the depth of breaking, B, is the berm height, mn is the beach face slope, Xb, is the surf zone width, and, C, is a constant. A graphical representation of the results of the convolution method is shown in Figure 3.3. It should be noted that this method is not dependent on the wave period, and assumes the wave heights are constant for the entire storm duration. Figure 3.3: Beach-profile response to waves and surge where R_. is the recession at equilibrium, and R(t) is the recession at a certain time, t.
Figure 3.4: Differential angular planform area, where 0 is in degrees. The total volume is the sum of all of the differential volumes, DVOL, for all of the selected radii between each of the angular sections. then calculated from Eq.3.3 with an assumed value of P3, the dimensionless time-constant. Finally, the change in volume of the delta was calculated as the sum of volumes eroded between the pre- and post-storm profiles. A graphical representation of the convolution method applied to an single ebb delta radial profile is shown qualitatively in Figure 3.5. The code for modulation of the ebb delta volume is given in Appendix G.
The calculation of equilibrium recession, R_, of a delta radial profile is simply a geometrical exercise, but to calculate the time-dependent recession, R(t), a time-constant, T1, is needed. As noted further in Section 4.3, because of a lack of post-storm surveys of deltas, and no preceding analytical or numerical methods for determining the change in delta volume due to storm effects, the TS relation Kriebel and Dean (1993) proposed for application to beach profiles could not be applied to the delta profiles. As a result, in order to apply Eq.3.4 a value was assigned to P3 that gave reasonable recessions of the seaward slope of the delta for extreme storm conditions. found for each radial profile. A sine function relation was used to simulate refraction of the breaking wave heights, Hb around the delta. Figure 3.5: Delta radial profile response where R. is at equilibrium, and R(t) is at a specified time, t.
Figure 3.6 is a planformn view of the delta, which illustrates the relative magnitudes and approach angles for the waves breaking on the crest of the delta. Figure 3.6: Planformn view of the delta illustrating the assumed magnitudes and approach angles for the breaking waves, HB, on the crest of the delta. Where 8 is the angular offset and Rm(n) is the radius to initial sediment mobilization depth, Hm. The delta volume modulation code in Appendix G calculates a value for the slope of the delta profile at the depth of limiting motion, and solves for 8, which sets the initial slope of the deposit profile equal to the slope of the delta profile. Figure 3.6 is a non-dimensional plot of the deposit profile with an arbitrary 8. Figure 3.7 is a plot depicting the deposit profile, for arbitrary values of 8, S, R(t) and H.. The solid lines correspond to the delta profile, while the dashed line is the deposit profile. Figure 3.7: Nondimensionalized deposit slope, 6 = 0.2443461. Figure 3.8: Deposit slope for an arbitrary set of values of 5, S, R(t) and H.. In this chapter geometric deltas are constructed, and the effects of differing no-inlet profiles on the resulting delta volume are studied. Values of the no-inlet shape and scale factors are varied, producing both steep and flat profiles, and the corresponding changes in the delta volume are documented. Then, realistic ranges of wave and storm surge forcing are used to erode the delta, and the reduction in delta volume as well as changes in the location of the top of the delta are examined. Finally, several case studies related to delta volume change are presented and discussed. In order to define the delta volume, the intersection of the delta profiles with the noinlet profile must be found. Under certain combinations of the parameters A(n), M(n), VI(n), An and Mni, the power-law, i.e., Eq.2.5, for delta profiles and the equation for the no-inlet profile, i.e., Eq.2.3, do not intersect. Therefore, the parameters for input into Eq.2.5 had to be chosen so that this non- intersecting situation did not occur. Using the relationships for the coefficients A(n), M(n) and VI(n) derived from the least squares fitting of the data from the Jupiter Inlet delta, a characteristic delta was developed. The input parameters for this delta were: CW = 100 m, HC =3 m, AK = 0.079, Amin _:0.05, K~ = 0.34, Mnax = 0.8, K = 1.5, 0 = 0.35 m, Vj = 1400 mn, Yj = 800 m.
These particular values were chosen so that the resulting delta would have a maximum volume of approximately 10' m3 above the no-inlet profile. It should be noted that the relatevely small selected value of AK produced a much flatter parabolic curve shown in Figure 2.8. For a given set of A(n), M(n), and VI(n) in the seaward slope equation, i.e., Eq.2.5, the delta volume was found to be sensitive to the slope of the no-inlet profile, i.e., Eq.2.2. When a steep no-inlet profile was chosen, the seaward slope of the delta intersected the noinlet profile in deeper water and at a larger radial distance from the profile origin, resulting in a larger delta volume than for the same seaward slope parameters intersecting a flatter noinlet profile. Figures 4.1 and 4.2 show isometric and side views of the initial delta seaward slope specified above, intersecting a steep and flat no-inlet profile, respectively. Figure 4.3 is a plot of the delta volume versus the A,,i scale parameter for different values of the KiNJ shape parameter. This plot illustrates the significant dependence of delta volume on the choice of the no-inlet profile. Table 4.1 attempts to quantify this sensitivity of the delta volume to the definition of the no-inlet profile for a specific delta seaward slope, in terms of delta volumes for two values of the no-inlet profile scale parameter, and 10% deviations from these values. As observed, the larger scale parameter, corresponding to a steeper profile, had larger differences in volume when varying the scale parameter by 10%, than for the flatter profile. Figure 4.1: Isometric (a) and side (b) views of an arbitrary delta volume with parameters: CW = 100 m, HC = 3 m, A. = 0.05, C~ = 0.7, AK =0.079, Amin = 0.05, MK = 0.34,Mma0.8, Kc 1.5 m, c=0.35 m, VImx 1400 m, VIn = 800 m.
:__ _(a) . . .. . . Figure 4.2: Isometric (a) and side (b) views of an arbitrary delta volume with parameters set to those in Figure 4. 1, except with C,1i = 0.675. Figure 4.3: Dependence of delta volume on the no-inlet shape and scale parameters, An and Mni. The remaining delta parameters are equal to those in Figure 4. 1. Table 4. 1: Dependence of delta volume on the no-inlet scale parameter for a given delta seaward sloe. nourishment project using delta sediment, it is important to accurately represent the no-inlet profile for delta volume calculation. In order to calculate the decrease in the delta volume due to severe seas, the method of Kriebel and Dean (1993), described in Chapter 3.2 was applied to each of the radial profiles. In summary, this method assumes a time-lag between storm forcing and profile response. Time-dependent profile recession is defined as a function of the ultimate profile recession and the erosional time- constant for that particular profile. The ultimate recession is defined as the maximum recession if the storm forcing conditions were allowed to become the new ambient conditions. Ultimate recession, as described in Chapter 3. 1, was investigated by Bruun (1982). The Bruun Rule of shoreline erosion due to a rising sea level states that the ultimate profile recession is derived by shifting the profile (out to the depth of limiting sediment motion defined by the ambient wave conditions) upward by the elevated water level and then landward until the volume of sediment per unit beach width eroded in the nearshore zone equals the corresponding volume accreted in the offshore zone. 0.7 ........ . .. . . . . . . . . . . . . .
0.6 ........ . .. . . .. .. . . . .. . . . .. . .. . .. . . .
0.5 R esponse....... .. .. .. ... . .. .. . .. .. ... .. .
0.4 ........ . . . . . . . . . . . . . . . . . .
0.3 ........ .. . . . . . . ... . . . . . . . . . .
0.2 ....... . .. . . . .. . . . ..:. . . . . . . .. . ... .
0.1 ........ . .. . . . .. . . . . .. . Figure 4.4 Plot of non-dimensional time-dependent profile recession versus phase of storm, 7ctTd, with P3 = 0, corresponding to no lag in profile response and, 7 C/2, selected for determining delta response. response, RJR(t), derived with no lag between the sin 2(TitT ~) storm surge forcing and profile recession (corresponding to P~ = 0 in Eq. 3.3) with the line of non-dimensional profile response with a time lag between forcing and response corresponding to the selected value of P3 = 7r/2. It should be noted that the maximum profile recession will always occur prior to the end of the storm event. Profile response after that time is recovery, which has not been considered in this study. induced changes in the delta volume, a value for T, in Eq.3.3 was chosen to be equal to one quarter of the storm duration, i.e. T, = Td~/4, which yielded P3 = rCI2 from Eq.3.3. The reasoning behind choosing this value was that the resulting maximum delta erosion was seemingly reasonable relative to the ultimate delta erosion that would occur if the delta were allowed to equilibrate with respect to the increased maximum water level and characteristic wave height. The Bruun Rule of erosion assumes profile recession in such a way that there exists a conservation of sediment eroded in the nearshore zone, and accreted in the offshore zone, as shown in Figure 3. 1. In the present analysis, the delta volume during the storm is defined as initial volume above the no-inlet profile minus the eroded volume, as shown in Figure 3.5. Defining the delta volume in this manner does not include the accretional portion of the delta profile. However, this definition seems to be qualitatively consistent with the usual way in which delta volumes at inlets are measured from surveys. The method of Kriebel and Dean (1993) for cross-shore profile change simulation has the greatest accuracy when applied to a shoreline with straight and parallel depth contours. If waves break at a non-normal angle to the shoreline, the resulting longshore sediment transport will be constant along the shoreline, and only the cross-shore component of transport will change the beach profile. When anomalies in the shoreline exist, the shorenormal and tangential components of wave height do not remain constant, due to the changing angle of breaking waves with respect to the shoreline. As a result, both cross-shore and the longshore sediment transport vary along the shoreline in the vicinity of the anomaly. 5 . . . . . .. . . .. . .. . . . . .. . . .
4.1~ ~ ~ ~..... and 4.2,5 force by. difrn.omiain.o.aehigt.ntomsr.. Fgues4. Figure 4.7: Plot of delta volume during storm versus storm surge, S, for variable wave height H0 and P3 = -x/2. The initial delta condition is that of Figure 4.1 with Vhmx = 1000 and Vimy =500, effectively producing a smaller delta. Figure 4.8: Plot of delta volume during storm versus storm surge, S, for variable wave height H0 and P~ = iT/2. The initial delta condition is that of Figure 4.2 with Vfrnx = 1000 and Vimy = 500, effectively producing a smaller delta. Ho 4:(M).. Ho 4.5(m) Ho =5:(m) .. .. .. .. .. .. .. .. .. .. .. .. . .. .. ..I .. .. ..( .. .. .
that for the given initial depth of the delta crest, small waves did not mobilize sediment to a great enough depth for any considerable profile adjustment to occur. As a result, the delta with the flatter no-inlet profile had both a larger percentage of its initial volume eroded, as well as a larger total volume of sediment eroded for the same wave and surge conditions. It should also be noted that delta erosion was a function of both wave height and storm surge. The dependence of profile recession on storm surge is inherent to the method of Kriebel and Dean (1993). As a result, there would be no profile erosion in the case of of increased wave action without an accompanying storm surge. This effect is evidenced by the zero change in delta volume when forced by zero surge and any wave height in figures 4.5, 4.6, 4.7 and 4.8. Increased wave action from typical tropical or "Northeaster" extratropical storm systems will always have an associated storm surge and setup; therefore the above mentioned effect is very unlikely to occur in nature. Figure 4.9: End of storm radial profiles for the steep no-inlet condition with [(a) and (b)], and without [(c) and (d)] the accretionary portions of the profile included. Theta refers to the profile angular orientation with respect to the updrift shoreline. The equilibrium profile is the solid line, and the maximum recession profile is the dashed line. a large recession of the delta seaward slope, which caused an increase in the depth of the delta crest. Such a reduction in the height of the delta can cause a larger percentage of wave energy to be transmitted across the delta, which could possibly have an adverse effect on the stretch of coastline no longer partially sheltered by the delta. (d).. .. . .. . . . . .. . Figure 4. 10: End of storm profiles for the initial condition in Figure 4.2 with [(a) and (b)], and without [(c) and (d)] the accretionary portions of the profile included. Theta refers to the profiles angular orientation with respect to the updrift shoreline. The profile is the solid line, and the maximum recessed profile is the dashed line. .. . . . . . . . . . . . . . ... . ..
. .. . ... .. .. .. .. . ... ... .. .. ... . ..
storm surges became large relative to the delta thickness, the deposit slope determined by Eq. 3.9 incorrectly simulated a large portion of the accretionary region of the radial profile. However, it should be noted that despite this problem, that assumed form of the deposit slope is an improvement over the linear deposit slope used in the Bruun rule of erosion, and provides a better qualitative description of the eroded profile. Planform views of the evolution of the top of delta for four different wave heights and storm surge increasing from 0.5 to 3.5 mn in increments of 0.5 m for the steep and flat no-inlet profiles are shown in Figures 4.11 and 4.12, respectively. The recession of delta nose was larger in the case of the flat no-inlet contours than for the steep no-inlet contours, as also evident from Figures 4.9 and 4. 10. The plots in Figures 4.11 and 4.12 have apparent "hinge points" about which the top of delta recession swung with increasing storm surge. This hinge point is a result of the assumed mode of wave refraction around the delta, as described in Section 3.6. As the depth of sediment mobilization due to wave action decreased along with the angle between the profile and the nearest shoreline, the surf zone width on the delta became so small that little or no profile recession occurred. Also, the profiles in the range of 0' to WO with respect to the nearest shoreline for the extreme normally incident wave height of HO = 5.5 mn were not acted on by large enough waves to cause any significant profile adjustment. Figure 4.12: Planform views of the evolution of the top of delta of Figure 4.2 with increasing values of storm surge and changes in incident wave height, H0. Solid line is the initial condition and the dashed lines correspond to increasing values of storm surge from 0.5 m to 3.5 m in increments of 0.5 m, with the largest deviation from the initial condition occurring at the largest surge. shape and the same initial nose position, a larger shore-normal recession of the flat no-inlet profile delta is evident in the two side views. In connection with the above analysis, the following case studies illustrate the role of episodic sea wave conditions in modulating ebb delta volumes. For relating historical delta volumes with episodic extreme sea conditions necessary for the case studies, the hindcast Wave Information Studies, or WIS, data were acquired from the US Army Corps of Engineers (USACQE, 1996). WIS data used are wave heights calculated from historical wind speed and direction in variable depths of water at approximately every 0.50 longitude along the Florida panhandle, and approximately every 0.25' latitude along the Atlantic coast of Florida. The calculated delta volumes at the inlets chosen, i.e., Jupiter Inlet, South Lake Worth Inlet, and East Pass, were plotted versus the corresponding extreme WIS wave height during the preceding year. Note that similar plots were also made using, for example, the mean wave height of the preceding year. However, the maximum wave height, being an indicator of the extreme storms condition, yielded the best correlative results. bathymetric chart of the area surrounding Jupiter Inlet, including the ebb, delta (Coastal Planning and Engineering, 1994). Figure 4.16 is a plot from Dombrowski (1994) showing delta volumes versus year with two model-calculated growth curves with a = 0. 17 (from Eq. 1. 1), H0 = 0.54 mn, and a = 0.27, H0 = 0.68 mn. The significance of this plot is that is shows how the changing wave climate changes the rate of delta development and the ultimate value of delta volume for a given value of tidal prism at the inlet. Figure 4.15: Bathymetric chart of Jupiter Inlet (from Coastal Planning and Engineering, 1994). Figure 4.16: Ebb delta volume versus year with model-calculated growth envelope for Jupiter Inlet with a = 0. 17, H0 = 0.54 m, and a = 0.27, H0 = 0.68 m (from Dombrowski, 1994). Figure 4.17: Plot of delta volume at Jupiter Inlet and WIS hindcast wave data for the time period 1956-1993 (from USACOE, 1996). Figure 4.18: Plot of the Jupiter Inlet delta volume versus maximum hindcast WIS wave height during the preceding year. were almost the same. It should be noted that the volumes for Jupiter Inlet in 1978 and 1981 included in Figure 4.16 were not included in Figure 4.17, because the small scale of the National Ocean Service nautical charts used to calculate those volumes greatly increased the probability of error in volume. Customarily, the addition of jetties will cause the littoral sediment to be jetted further out into deeper water, causing the resulting delta to attain a much larger volume than in the no-jetty configuration (Marino and Mehta, 1986). Tomlinson (1991), in a study of the Tweed River Entrance in Australia whose jetties had been extended by approximately 400 m in 1960, calculated an accretion in the delta region of approximately 2x 106 in'. He stated that a new equilibrium will occur when the controlling depth over the delta decreases to the previous controlling depth, and the sediment by-passing pathway is re-established by the delta crest completely connecting with the downdrift sand bar system. Thus, from the effects of jetties apparent in Figure 4.18, it can be considered that fluctuations in delta volumes at microtidal inlets must be examined carefully for likely causative factors, in this case both waves and structural modifications. South Lake Worth Inlet was artificially opened and stabilized in 1927. The spring tidal range near this inlet is 1.24 mn (Dombrowski, 1994). A sand transfer plant was installed near the end of the north jetty in 1937. In 1967 the plant was moved seaward by 36 mn and its pumping capacity was enlarged in conjunction with the north jetty extension of 125 mn. Figure 4.19 is a bathymetric chart of the area surrounding the inlet, including the ebb delta. Figure 4.20: Ebb delta volume versus year with model-calculated growth envelope for South Lake Worth Inlet with a = 0.03, H0 = 0. 19 m, and a = 0.60, H 0= 0.28 m (from Dombrowski, 1994). tidal prism. In that connection it should be pointed out that if the time-dependent growth curves are correctly redrawn, they would abruptly change slope at the 1967 data point, corresponding to the extension of the jetties, and achieve an equilibrium volume greater than that in the 1990 survey sometime beyond the turn of the century.
. *... .. .. .. . .. . .. .. ..... ... ... ..... ... . . .... .. .I.. ... ... .. Figure 4.21: Plot of delta volume South Lake Worth Inlet and WIS hindeast wave data for the time period of 1965-1993 (from USACQE, 1996). Figure 4.22: Plot of the South Lake Worth Inlet delta volume versus maximum hindcast WIS wave height during the preceding year. .. .. . .. . 1 : . . .. . . .. . . .. . . .. .. . .. . . .
... ... ... .. . . . . .. . .. . ...967. . . . .. . .
corresponding to the years close to the jetty extension, we find that the 1990-1979 (dashed) line does indicate the anticipated inverse relationship between delta volume and wave height. It should be noted that the volume for 1978, which was included in Figure 4.20, was not included in Figure 4.21 because of the small scale of the NOS nautical chart used to calculate that volume. A navigation channel was dredged at East Pass in 1930. The spring tidal range at this inlet is 0.43 mn (Dombrowski, 1994). The channel was deepened and widened in 1945, and required subsequent maintenance dredging to sustain the 3.7 mn project depth. In 1967, the U.S. Army Corps of Engineers began the construction of converging rubble-mound jetties with a weir section in the west jetty to stabilize the mouth of the pass and improve navigation. In 1977, a spur jetty was added to the landward end of the east jetty in order to divert the ebb channel toward the centerline of the jetties. In 1985, the weir section in the west jetty was closed. The inlet channel is continuously dredged across the ebb delta in order to avoid hazardous navigation situations that tend to occur due to the rapid channel migration and shoaling (Morang and Irish, 1996). Figure 4.23: Bathymetric chart of East Pass (from USACOE, 1990). Figure 4.24: Plot of delta volume at East Pass and WIS hindcast wave data for the time period 1965-1976 (from USACQE, 1996). . . . . .. . . . . . . . . . . . . . . .
. . . . .. . . . .. . . . . . . . . . . . . . . .
2.3 1.. . . . .. . . . . . . 970 . . .. . ... . Figure 4.25: Plot of East Pass delta volume versus maximum hindcast WIS data during the preceding year. construction of the converging jetty system was begun in 1967. Customarily, the addition of jetties causes the littoral sediment to be jetted further out into deeper water causing the resulting ebb delta to attain a much larger volume than for the no-jetty configuration. Therefore, the addition of a jetty system would not be responsible for the reduction in the delta volume as seen in Figure 4.25. Apparently, the relative reduction in delta volume due to increased wave heights was much more significant than the likely increase in delta volume due the equilibration of the delta system under the jettied configuration. Although WIS data were not available for the period extending to 1990, delta volumes did increase by aapproximately 0.7x 106 M3 above the pre-jetty volume in 1967. On October 4, 1995, Hurricane Opal occurred with an estimated 4.45 mn storm surge and a maximum wind speed of 67 in/sec. The elevated water level overtopped the barrier island, and in conjunction with the increased flood tide through the inlet and fresh water runoff, caused an extreme elevation in the Choctawhatchee River Basin. As a result, considerable water exited through East Pass. There was an extreme reorientation and erosion of the inlet channel, but no appreciable change in the planform of the inlet ebb delta crest (from Morang and Irish, 1996). As found in the delta erosion model, the maximum change in delta volume occurred some time during the storm. A post-storm survey measured the accretion on the delta that was actually derived from channel sediment when the surge receded, and the high ebb currents deposited channel sediment onto the delta. The Katikati Inlet in New Zealand is bounded by a rock headland acting as a jetty stabilizing a sandy coastline on the north and a sand barrier island on the south. The spring tidal range is 1.64 in (Hume et.al., 1996). Figure 4.26 is a bathymetric chart of the area surrounding Katiakati Inlet, including the ebb delta. The delta has been classified as a storage cell for sediment, being a poor tidal by-passer under normal circumstances, but a bar by-passing delta under north storm conditions. By examining 12 aerial photographs and relating them to historical storms, Hume et.al. (1996) determined that large storms had a significant effect on the morphology of the delta, and the time period of recovery to a similar pre-storm geometry took years. 1?1 1 1 . . . . . Figure 4.26: Bathymetric chart of the area surrounding Katiakati including the ebb delta (from Hume et.al., 1996). Figure 4.27: Ebb delta at Katiakati Inlet (New Zealand) ebb delta protrubance from the shorline over a 50 year period (adapted from Hume et.al., 1996). delta from a horseshoe-like tide-dominated geometry to a wave-dominated geometry that was flattened against the coastline. This storm event changed the morphodynamics of the delta for approximately a decade. Smaller storms, which did not cause the magnitude of change experienced during the storm of 1975, have correspondingly had smaller time-scales for readjustment to the pre-storm condition. Figure 4.27 is a plot of the extent of the ebb tidal delta (ETD) in the shore-normal (SN) direction, or protrubance of the ebb delta at Katiakati Inlet over the years. Note that the excursion of the proturbance, or the nose, is qualitatively consistent with the simulation given in Figure 4.12. In recent years at least sixteen inlet ebb deltas on the United States East and Gulf Coasts have been mined for beach nourishment sediment. Presently, the effects of these delta minings on the processes of the inlet/beach system are not well understood. However, it is known that the mining of sediment can change the wave refraction pattern, which in turn can result in changes in the magnitude and possibly the direction of sediment transport in the vicinity of the inlet. The main objective of this study was to determine generalized responses of the delta volume to storm forcing, and from that to develop an understanding of how real deltas respond to storms. A geometrical delta was developed by fitting a power-law equation to radial delta profiles digitized from a typical microtidal ebb delta. Then, a previously developed method of beach profile response was modified for application to the delta profiles. Finally, the response of the delta was compared qualitatively to relevant case studies. The following is a brief summary of this work. characterizing the seaward slope equation were variable with respect to the radial profile angle relative to the updrift shoreline. In order to determine the quantity of material in the delta, the elevations of delta profiles were referenced to the corresponding elevations of the profile that would exist if the inlet were not present, i.e., the no-inlet profile. The calculation of the delta volume thus obtained was found to be extremely sensitive to the choice of the no-inlet profile. Since there often exist large shoreline offsets or changes in profile slope between the updrift and downdrift sides of an inlet, considerable care must be taken when choosing the location of the origin and slope of the no-inlet profile when calculating the volume of an actual delta. To simulate the reduction of ebb delta volume due to waves and elevated surge conditions, a method derived by Kriebel and Dean (1993) to predict time-dependent beach profile response was modified and applied to the seaward slope portion of the radial profiles around the delta. This method also attempts to predict the recovery process for beach profiles. However, since the recovery process of ebb deltas characteristically differs from that of beach profiles, the application of the model was limited to the duration of the storm over which erosion occurs. Because insufficient post-storm survey data exist to calibrate the erosional time-constant for delta profiles, a value was assumed which gave reasonable results of profile recession. a much larger percentage of volume lost than deltas with steeper no-inlet profiles under the same wave and surge conditions. It was also found that the nose of the delta, or the region of the delta furthest away from the shoreline, showed considerable recession, while the delta region closer to the shoreline did not experience significant adjustment. The study by Hume (1996) on the ebb delta at the Katiakati Inlet in New Zealand, where the delta morphology was determined from aerial photographs for a period of approximately 50 years, seems to agree with the model results of the overall flattening of the delta against the shoreline during extreme storm events. Comparisons of historical delta volumes with WIS wave data showed an inverse relationship between delta volume and the maximum wave height during the preceding year at Jupiter Inlet and East Pass, confirming the laboratory observations of Hayter et at. (1988) and the analyses of Walton and Adams (1976) and Dombrowski (1994). On the other hand, there was no distinct relationship between the delta volume and maximum wave height at South Lake Worth Inlet, presumably because the ebb delta there is still growing, and has yet to achieved a quasi-equilibrium with respect to the average wave conditions. 5.2 Recommendations for Future Investigations It is concluded that not enough surveyed delta bathymetries exist for a better understand of the processes and time-scales involved in the storm-induced delta erosion and recovery cycle. In order to make a more accurate prediction of the influence of increased wave height and surge on the delta volume, or the effects of delta mining and borrow pit recovery on the surrounding shorelines, a data base of periodic as well as post-storm bathymetric surveys must be accumulated.